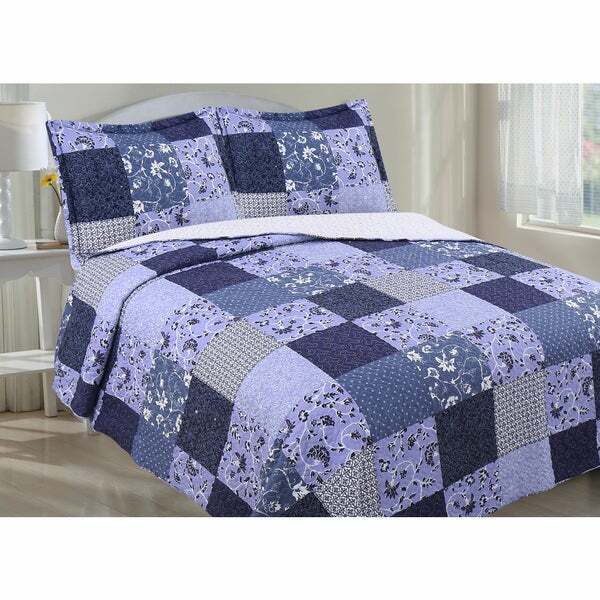 Give your bed a contemporary floral pattern with the luxurious feel of microfiber and sherpa with this quilt set. This set includes a quilt and two matching sham pillows for a coordinated look. Throw this quilt in the washing machine anytime for convenient cleaning. This quilt is so soft on the sherpa side. It is just the right weight since I don't like really heavy comforters. The pillow shams are also sherpa on the reverse side, so my cat loves to sleep on them! Perfect warmth, but not too much. Only wish is that it was a little wider for the king size bed. Hangs long on the end, but needs a little more on the sides. This quilt is beautiful. Not too short on the sides like most queen sized comforters. It's so soft on the inside. I will definitely be recommending this to friends. The Sherpa Reverse Quilt set is absolutely beautiful! I bought this as a Christmas gift for a dear friend and I'm excited to see the look on their face and how much they love it! Thank you Overstock! I love the quilt, light and keeps warmth in. I just hate not having the shams. I had been looking for a quilt for some time. Probably within 3 minutes of looking on overstock I found this. It’s beautiful, the colors are vibrant, and it’s very well made. The Sherpa on the inside is so soft and warm for cold nights but I don’t find myself being too hot either. It’s perfect!! This is a very warm quilt very good for winter months. The color is perfect it’s soft purple. My husband and I love this new quilt. It is not too heavy but it so soft and warm. Definitely a fan of Sherpa. Nice pattern, and the underside is nice and fluffy - it is very comfortable! I love this quilt with sherpa. So cozy! As for overstock, they're a great company with super service and delivery time frame! Because it will go with a bedroom decore. It is a type of material look and feel like sheep but it is fake. "Hi! Lovely quilt set! Is this blue, or does it have a purple tinge, like periwinkle color?" I love this quilt. It has shades of purple and is really warm. I ordered a king for my queen bed. It is large enough to go past the top of the bed skirt and long enough to tuck under the pillows for an old fashioned neat look if you don't want to use the shams and extra pillows. I always get the next size up.